As the end of April nears, so does the final date of the Washington Health Alliance’s participation in the Aligning Forces for Quality (AF4Q) program. 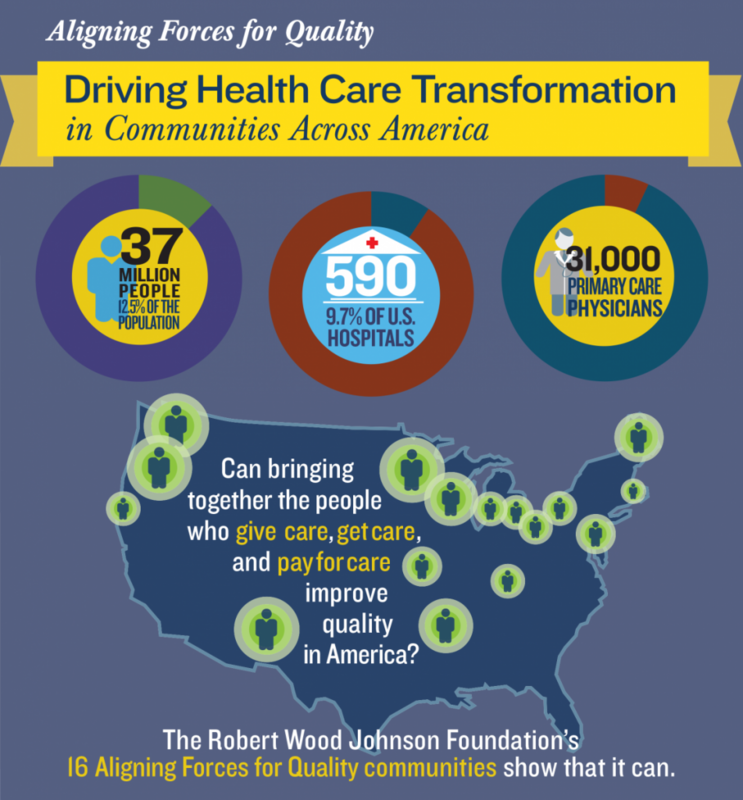 AF4Q has been the Robert Wood Johnson Foundation’s (RWJF) signature effort to lift the overall quality of health care in targeted communities and provide models for national reform. The Alliance was one of the first four pilot sites selected by RWJF in July 2006 to launch the AF4Q program; the three other organizations included Minnesota Community Measurement, the Greater Detroit Area Health Council and the Memphis Business Group on Health. The AF4Q program became a highly competitive national grant program that lasted nine years and ultimately included 16 states and communities across the country – impacting 37 million people, 600 hospitals and more than 30,000 primary care physicians. Getting in on the ground floor of this program in 2006 was a tremendous opportunity for the newly formed Alliance, a small organization with a big vision and mission to transform health care in the Puget Sound region, Washington and beyond. The initial AF4Q three-year grant kick started our work, and made us a part of something bigger. We’re grateful to have been a part of it. At the heart of the AF4Q program is the belief that health care is a national problem that is is solved locally and transformed through local action. From its earliest days, the Alliance found a kindred spirit in the AF4Q program. We were both focused on building a local, multi-stakeholder organization ― bringing together those who get, give and pay for health care ― to support and drive health care performance measurement and public reporting, consumer engagement and provider quality improvement. Fast forward nine years, and the Alliance is looking back on an incredibly rich experience of learning and working with RWFJ and 15 other health improvement collaboratives in states such as Pennsylvania, Maine, Wisconsin, Oregon, Michigan, New York and communities such as Albuquerque, Boston, Cleveland, Cincinnati, Kansas City and Humboldt, California. Credit: Robert Wood Johnson Foundation. Over the years, AF4Q participants have found and tested new ideas in a number of areas including ambulatory and inpatient care improvement, care across settings, consumer engagement, cost and efficiency, equity, patient-centered care and payment reform. Making connections and building relationships with other AF4Q organizations has strengthened our own resolve and helped us share and learn lessons that have helped shape our own organization. We have been privileged to be a part of this important program and are grateful to the Robert Wood Johnson Foundation for the opportunity. Over the next couple of months, we plan to share some of our lessons learned and successes that were made possible for the Washington Health Alliance by this experience. Thank you RWJF and AF4Q! Susie Dade, Deputy Director of the Washington Health Alliance, is also the Project Director of Washington’s AF4Q program. Susie Dade is the deputy director at the Washington Health Alliance where she leads efforts in performance measurement, payment reform and performance improvement. From 1980 to 2005, Ms. Dade held several delivery system leadership and health planning positions with Group Health Cooperative, Central Seattle Community Health Centers and the Puget Sound Health Systems Agency.